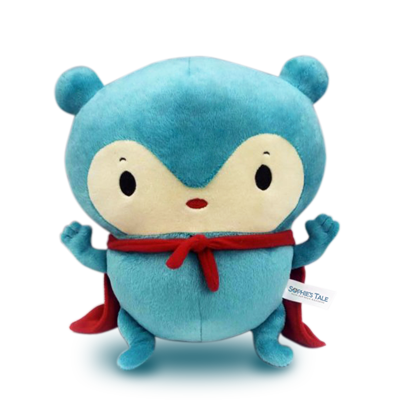 Sophie's Tale Has Partnered with Budsies To Create a Plush Mebo Toy. In the fall of 2017, Sophie's Tale, Agatha Bobblesbee and Budsies worked together to bring Mebo to life! We worked hard to make our 3D plush Mebo, a real world doppelganger. From the aqua blue color of his soft fur, to the roundness of his moon face and the ruby red of his Super Bear cape. This curious little bear is oh-so cute! Select either the Book and Bear Gift Set or Mebo Plush Bear. An enthusiastically recommended and charmingly original picture book story, "Learning to Fly: By Mebo" will prove to be an enduringly popular and entertaining addition to family, daycare center, preschool, elementary school, and community library collections. It should be noted for personal reading lists that "Learning to Fly: By Mebo" is available in a paperback edition (9780998962818, $11.99) and in a digital book format (Kindle, $4.99). The story is cleverly executed and, apart from the message, it also introduces young readers to the blue panda, a rare breed of bear only found in the Himalayas. All blue pandas have a sweet tooth and Mebo also has a sweet tooth. The illustrations are delightful and will make children want to fly and dream like Mebo. It is a good bedtime storybook and children will love listening to their parents reading it out to them. Mebo is cute and lovable and teachers can use this book in classrooms for story-telling and read aloud sessions. The journey readers take along with Mebo while he is learning to fly is magical and enthralling. The presence of the moon in the story is captivating and adds to the whimsical effect. Books like this will fascinate and capture the attention of child readers with their pictures, contents, and adorable characters.